I copied the hair but appart from that, its 100% mine. It may look finished but i didn't finish putting the shoes on him. Running without shoes?! Comon... give the poor guy some sneakers wouldja? 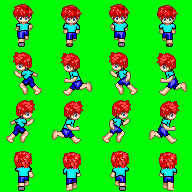 Subject: Re: Admin's Own Sprite!